These thoughts on clutch performance are from Spencer Wood Icebox Sports Performance Resources. Ask any athlete, coach or sports fan ‘of all the athletic attributes, which is the most important?’ Even the most casual athlete, coach or sports fan will provide an answer that in some way relates to the mental toughness, potential and power locked away in our mind. Yet, for so many coaches and athletes, unlocking the incredible athletic potential and power held in our minds is sometimes as much a mystery as it is a source of constant heartache and frustration. Many teams and individual athletes know what it feels like to bring their ‘A’ game against one program one day, and then almost unexplainably, they bring their ‘C’ or ‘D’ game against the very next program. Even worse, for those athletes who have experienced a major performance or skills slump in a big game or even over the course of a season – the frustration can feel like a slow death. Unfortunately, far too many coaches and athletes know this feeling all too well. For the progressive coach the response to these challenges is more than just extra running or longer practices. While extra running, longer drills and additional conditioning can build certain aspects of mental toughness, and under a select few conditions may be suitable response for a lack of effort, games are not always won or lost because of a lack of effort. Games are often won or lost due to a lack of execution vs. lack of effort. The smart response then is to develop a mental skills and toughness training program that pinpoints the particular components of mental toughness that resulted in a lack of execution FOR EACH ATHLETE. Better still, coaches who proactively put such a plan in place before the start of the season will experience greater consistency and a significant competitive edge. So how does a coach and team begin to implement a mental skills and toughness training program for clutch performance? It has been said that “sometimes things do not go according to plan because a plan did not exist in the first place.” For mental skills this plan begins with an honest assessment of each athlete’s mental skills and toughness strengths and weaknesses. But what kind of mental skills and toughness traits should you assess? While a seemingly endless stream of words and phrases can be used to broadly describe mental skills and athletic toughness traits, a useful summary traces each of these traits to one of more of the 4 C’s of Peak Performance – Composure, Concentration, Confidence and Commitment. Together, these “4 C’s of Peak Performance,” Composure, Concentration, Confidence, and Commitment – work like a model of a 3 leg stool. 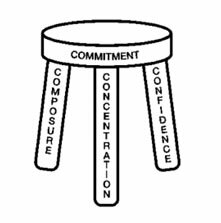 The first 3 C’s of Peak Performance – Composure, Concentration, and Confidence are like the legs of the stool. Lose one or more legs and the integrity and balance of the stool is compromised. Translation – our performance suffers. And the 4th C of Peak Performance – Commitment – is the seat or platform of the stool that takes our weight and sustains us. No commitment or motivation, no stool. Each of these 4 C’s of Peak Performance profoundly affects the others. Developing tremendous composure allows us to better perform our concentration skills. A composed athlete who is able to effectively concentrate whenever necessary, will be a confident and highly effective athlete. And finally, a fully committed athlete will have harnessed the necessary drive and motivation to passionately pursue their mental and physical potential – committing to the necessary physical and mental training, maximizing their composure, concentration and confidence, and striving for Peak Performance. The “4 C’s Stool” diagram illustrates this Peak Performance Model. The Peak Performance Assessment examines current levels of practice and competitive composure, concentration, confidence and commitment, in addition to a number of other factors that can profoundly affect each of the 4 C’s of Peak Performance. These questions are scored on a scale from 1-10. A score of 1 = a “strongly disagree/very low” score. A score of 9 = a “strongly agree/very high” score. A score of 10 is a very rare “near perfect” score and should only be used sparingly. Encourage each of your players to complete the Peak Performance Assessment with complete honesty. Great athletes are great because they work on their strengths AND their weaknesses.Only complete honesty will allow your players to objectively identify these strengths and weaknesses before they are able to effectively improve these skills. The coach should also complete an assessment on each player, and should be compared with the player’s self-assessment in a one-on-one meeting with each player. Any question with a score below a 7 should send up a ‘red flag’ and you should strongly consider working on this weakness with the athlete in question and turning the weakness into a future goal for improvement. Developing a mental skills and toughness training plan for your team will certainly involve a time commitment. But this critical skill set will add a new, challenging and fun component to your practice schedule. In addition, the more you continue to train your team’s competitive mental muscle and refine your player’s mental training skills, the closer you will come to your team’s real potential. The pay-off in consistent peak performance, individual player improvement and your overall win column can be significant.